Dimensions 3 by 6 by 8 in. 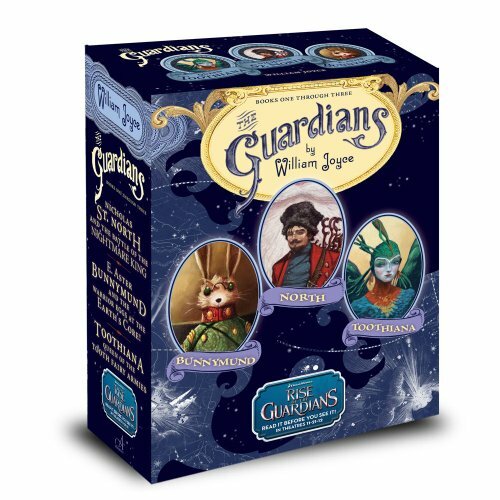 Amazon.com description: Product Description: This boxed set of the first three Guardians books is the perfect companion to the Rise of the Guardians movie! Of course you know the Guardians. Youâve known them since before you can remember and youâll know them till your memories are like twilight: Santa, the Easter Bunny, the Tooth Fairy, and the others. But where did they come from? How did they become beloved and worthy of holidays? And what nefarious evildoer prompts them to band together and protect the children of the world? Answers are revealed and imaginations unfurl in this this treasure trove of a boxed set. Both a standalone collectible and the ideal complement to the mesmerizing Dreamworks Animation movie Rise of the Guardians, this set includes the first three titles in the Guardians chapter book series: Nicholas St. North and the Battle of the Nightmare King, E. Aster Bunnymund and the Warrior Eggs at the Earthâs Core!, and Toothiana, Queen of the Tooth Fairy Armies. About: This boxed set of the first three Guardians books is the perfect companion to the Rise of the Guardians movie!